Get outside and explore the natural beauty that makes the Finger Lakes a true treasure. The natural setting is the very core of what makes the Finger Lakes so unique. 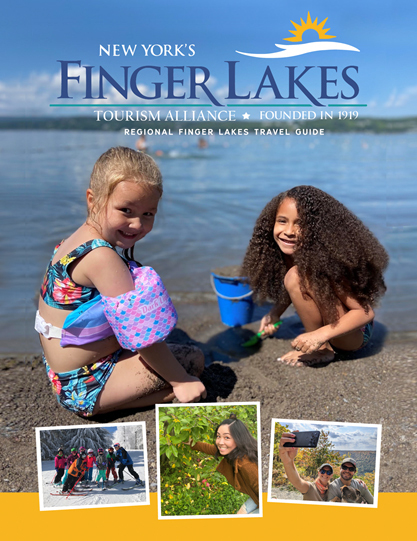 Don't think the outdoor fun starts and stops in the 11 major lakes of the Finger Lakes either; there are a number of parks, resorts and more to entertain you in the fresh air. In the winter the Finger Lakes region, businesses and places to explore is far from shut down and closed up for the winter! You can go to one of the many ski resorts, like the Greek Peak Mountain Resort in the Cortland area. There are also a number of hiking, snowmobiling and cross-country skiing trails throughout the Finger Lakes. Snowshoeing fans can also rent or bring their own shoes to pad through the snow-covered winter wonderland. The Finger Lakes are also great for ice fishing when the weather gets cold enough. Ice fishing is a local favorite once the snow flies and temperatures drop creating a thick layer of insulation between the liquid lake water below and the ice air fishermen sit among with small space heaters and gloves on their hands to see what the day's catch will bring in. Make a friend on the lake while fishing, or perhaps practice your ice skating figure 8's for a minute or two. Don't forget that the abundance of State Parks in the region also offer snowmobiling trails for those who want to bring the need for speed to the winter months. Those who prefer to take a leisurely walk in the woods can do so exploring the snowshoeing or cross country ski trails found throughout the region as well. The summer months bring out the best in the Finger Lakes as well. Boating, fishing, kayaking and other watersports certainly play a large role in what makes the Finger Lakes so special but there is just as much to do away from the water. The numerous state parks in this region, as well as the Finger Lakes National Forest, let you experience nature at its finest; you can camp, hike, bike and more in most of these parks. They also feature some wonderful scenery including waterfalls and gorges. If you're looking for a little more action there are many race venues in the Finger Lakes including Watkins Glen International, host of NASCAR in the Finger Lakes, IMSA, the SCCA and more throughout the racing season every year. You can also take to the sky during your next stay in the Finger Lakes. Hot-air balloons and gliding both have a home in the Finger Lakes. The Liberty Balloon Company gets you in the air in one of their hot air balloons anywhere across the Finger Lakes. Harris Hill has been a landmark for motorless flight since before WWII. Just outside Elmira, you can take to the sky in a glider and check out the National Soaring Museum. The outdoors is a great piece of the Finger Lakes experience and is not to be missed. It doesn't matter if you're looking for a relaxing day in the sun, a hike through the woods, or an exciting day on the water, you can find just about everything to do here in the Finger Lakes.